Wednesday was a big day. 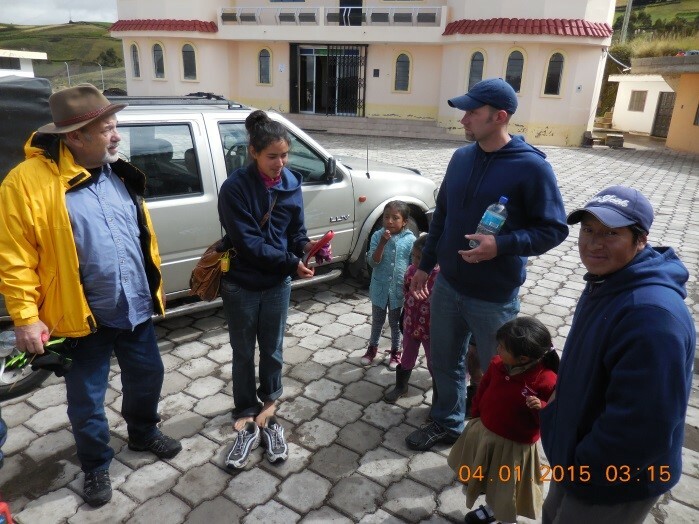 While our install team was busy making water, another team was off making a followup visit at one of our most successful sites; Promesa Divina in Colta Monjas Altos. While meeting with our friends of several years, we were honored to receive a Bible, written in their native language Quichue. Well, as it turned out, one our wonderful volunteers, Mr. Steve Wagner, had some experience in forensics, and he was asked to assist with the local investigation. Away he went, up the mountain for the next eight hours. During his adventure, Mr. Wagner was allowed to assist with a close up investigation (to say the least), measuring the depth of the puncture wounds, separation of fangs, tracks, and other important evidence. After a lengthy analysis, it was determined that the culprit was, in fact, a puma. At times, puma descend from higher elevations in search of food and water, and become more violent in their stressed environment. Mr. Wagner played an important role in this determination and our new friends were very appreciative. Agua Viva has learned in the past, that there are many harmful myths in these communities. This underscores the importance of education and its many challenges.